This game between the Jaguars and Titans was one of three games this week without playoff implications. JACKSONVILLE, Fla. — For two teams with nothing at stake, the Jacksonville Jaguars and the Tennessee Titans didn’t look like they were simply playing out the string Sunday. But there were enough moments in the Jaguars’ home finale to remind their fans of why any realistic thoughts of contending for so much as a wild-card berth are still a good couple of years away. 1. This is a sure way to guarantee a spot on everybody’s highlights. Of the Jaguars’ first 300 receptions this season, none were by offensive linemen. And the only time Brad Meester had touched the football in 14 years with them was whenever he snapped it from center. But with second down and eight yards to go from the Titans 13 in the first quarter, the 36-year-old got to live out every lineman’s dream in the final home game of his career. The Jaguars lined up Meester as a tight end on the right side, a indicator that something out of the ordinary might be forthcoming. Sure enough, Chad Henne hit him on a well-designed and extremely well-received screen pass. Despite bumping into guard Uche Nwaneri, Meester was able to lumber his 292-pound frame down to the 4, where middle linebacker Moise Fokou was credited with the stop. The Jaguars scored one play later on a pass from Henne to tight end Marcedes Lewis. 2. Two of the NFL’s best and more experienced kickers proved to be human late in the first half. After his 52-yard field goal narrowed the Titans’ deficit to 7-6 with 1:55 to go in the second quarter, Rob Bironas was visibly flustered on the ensuing kickoff. And with good reason. Instead of trying for a third touchback, he angled the kick away from the Jaguarsâ returners. The ball sailed out of bounds, allowing the Jaguars to start at their own 40. Ace Sanders scored with 43 seconds remaining after turning a bubble screen from Henne into a 7-yard touchdown. 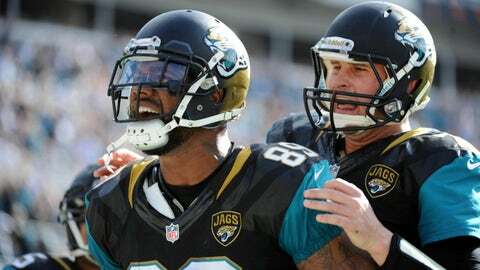 But Josh Scobee had his point-after attempt blocked by Bernard Pollard, which turned out to be huge later in the game. It was only the third time in Scobee’s 10 seasons with the Jaguars that a PAT by him was blocked. 3. Fourth down is the new third down. Both teams eschewed field-goal attempts on multiple occasions in favor of going for it. The results were mixed. Henne’s pass for tight end Clay Harbor with a yard to go in Titans territory late in the first quarter was broken up by Pollard. The Jaguars were more successful in the third quarter after Akeem Ayers of the Titans was penalized for lining up in the neutral zone. Maurice Jones-Drew picked up two yards over right guard to keep the drive alive, and Scobee booted a 36-yard field goal soon thereafter to pad the Jaguars’ lead to 16-6. In one of the game’s most crucial plays, Jones-Drew was stopped by defensive end Ropati Pitoitua for a loss of 1 at the Titans 21 with 5:21 to go. The Titans gambled twice on a drive which consumed nearly eight minutes. While Ryan Fitzpatrick hit tight end Delanie Walker for a gain of 11 the first time, his pass in the end zone for Walker on fourth and goal from the 1 was nowhere near him and the Jaguars took over on downs. 4. The rushing attack reverted to the form of the first 10 games. The Jaguars had gone over 100 yards four weeks in a row, enabling them to escape the basement of the league in rushing yards. Even with the return of Jones-Drew from a hamstring injury, they went almost exclusively to the pass. Through three quarters, they ran the ball only 12 times for a total of 32 yards. Jordan Todman was all but invisible after gaining 109 yards on 25 carries a week earlier against Buffalo. On the positive side, Henne threw for 181 yards in the first half, which was more than he had the entire game in the Jaguars’ prior meeting with the Titans. 5. It was another rough day for the rookies in the secondary. Strong safety Johnathan Cyprien was back after missing the loss to the Bills with a thigh injury and had no slip-ups until he was flagged for holding on a fourth-down scramble by Fitzpatrick to end the third quarter. Cornerback Dwayne Gratz hurt his ankle in the first quarter and did not return, while free safety Josh Evans’ tackling technique was hardly of the textbook variety on a 29-yard run by Shonn Greene. Veteran cornerback Alan Ball made his second interception of the season but was also beaten on the 30-yard TD pass from Fitzpatrick to wide receiver Nate Washington which put the Titans ahead to stay. Since the Colts have clinched the AFC South, the Jaguars could catch a team unwilling to risk its starters to injuries before the playoffs.